The young Professor impatiently looked at the mechanic watch on her wrist. Five (!) minutes after the bell rang and still she was sitting in the classroom with those very few individuals, who cared enough about Transfiguration to arrive on time. Despite being slightly annoyed, she smiled as the door opened to let the latecomers in and waited for them to settle down. Hopefully, there were not going to be more, it didn't seem alright to give away extra tasks or detentions slips so early into the day. "Good morning, everyone, and welcome to the new term! For those, who don't know, I'm Professor Black, and I'm not going to torture you with any spell practices as for now. Instead we shall try and grasp a better understanding of Transfiguration." 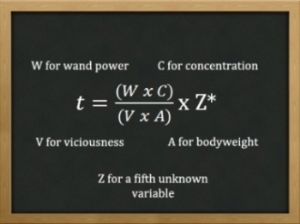 She tapped her wand on the blackboard, making the complex formula to appear. Auden walked into the classroom. She was late. " Sorry Professor." Auden said while taking her seat.
" Thats quite alright Auden just take your seat so we may carry on with the lesson" said Professor Black and she continued on with the lesson. It turned out that Aylee was one of the latecomers. She burst into the classroom and exclaimed, "Sorry Professor!" She blushed as most heads turned to look at her. She hated being centre of attention. Then she just slowly found a seat at the back of the class and listened to Professor Black talk. Rebecca was already sitting down in the classroom, listening and watching the explanation. The formula was confusing her. She was never good at algebra. Okay, the girl thought jokingly. So when we're going to do Transfiguration, we are going to have to do Algebra...? Shaking her head, she tried to understand Professor Black's explanation. Then she suddenly raised her hand. "What is that star next to the Z?" Rebecca asked, staring at the blackboard. Professor Black was going on about the lesson when she turn around she notices Rebecca's hand was raised the Rebecca said "What is that star next to the Z?" "Rebecca the star is the fifth unknown variable." now she goes to addressing the class and says "I know what the rest of you are thinking we are using math but in reality this is just kind of how it is worked out in physics type way but now if you will all take out your wand while I pass you guys out these matches." Professor blacked walked up and down the rows giving each student one match. "now I know for you older students you may have already done this so that means this lesson should be fairly easy, as for you younger students what you need to do is really concentrate on what you want to turn this match into which is a needle. You will wave your wand over it in a small circle twice then tap the match and it should change." as she said this she demonstrated it. Easy, Lucy thought as she recalled her summer practices. She had done this a million times before, as her dream of becoming an Auror required her to take advanced Transfiguration in the future; she wanted to be better than before. Taking out her Walnut wand, delicate but strong enough to perform great magic as she had found out overtime, she concentrated on the spell and on the match in front of her. Slowly, the match began to turn gray and then silver, a sign that she was going in the right track. After three seconds, the match was no longer there but a nice, pointed needle stared back into Lucy's gray eyes. Rebecca blushed a bit at the Professor's answer. Still she took out her wand as she was handed the matchstick. Scared, the Gryffindor waved her wand twice and tapped the match. Immediately, the match somehow disappeared and in its place was a needle. Aylee looked at the match when she received it, excited to try a new spell. Building up her courage, the Ravenclaw took out her wand and waved it around the object twice. I can do it... She wasn't very good at spells. Sighing, Aylee tapped the matchstick and gasped. In its place stood a shiny needle. Auden listened carefully to the Professor. She couldn't wait to try the spell out. Auden took out her wand and waved it around the match twice. Auden then tapped the match. A second later, the match turned into a sparkly shiny needle. Grace was watching everyone turn their match into needles. It was a simple spell to start off Transfiguartion. Grace grabbed her wand and waved it around the matchstick twice. She saw that in its place, was now a shiny needle. She was happy with herself, and she couldn't wait to do more daring things.